Insulation: 2” fiberglass vapor barrier metal building insulation in roof system. A Camano Island Washington couple desired a steel garage and workshop building on their property. The clients enjoyed collecting and restoring classic cars. Their growing collection of cars required additional garage and shop space. We have built 1000’s of garages with workshops since our beginnings in 1973. 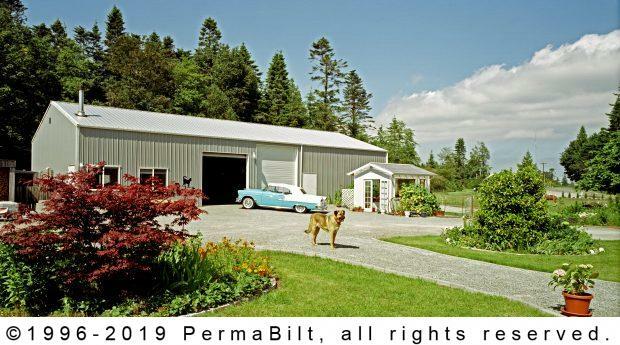 It didn’t take long in an initial meeting with a PermaBilt® Building Representative to come up with the perfect design for this couples’ building. Once the planning, design and permitting were completed, the PermaBilt® construction crew was ready to erect this good sized building. Ultimately, the customer converted a portion of the building into living quarters after meeting with the county and fulfulling the additional requirements for a habitable space. their classic cars in their new digs, dreaming of picking up a “best in class” trophy at the next Greenwood Car Show.